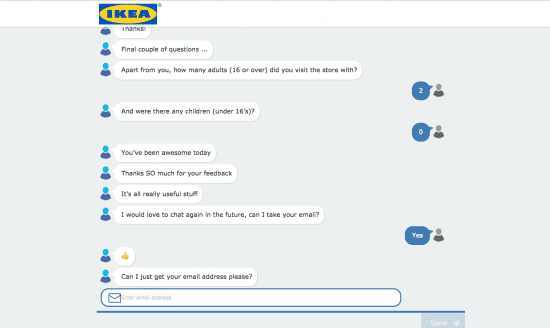 Global home furnishings and meatball brand (IKEA sell 150 million meatballs a year), IKEA of Sweden already innovate in their democratic design approach when producing new products, but now they're taking a leading approach with their customer insights: chatbot surveys. The IKEA concept already works to make their products attractive, functional, sustainable, accessible and affordable. IKEA are the masters of efficiency and it seems that they are working with their research agencies, to take this approach to customer insight. The world of market research and insight has somewhat an obsession with innovation, researchers are always looking for new ways to gain insights, hence big data, online communities, shorter surveys (though I question whether many are actually getting shorter). 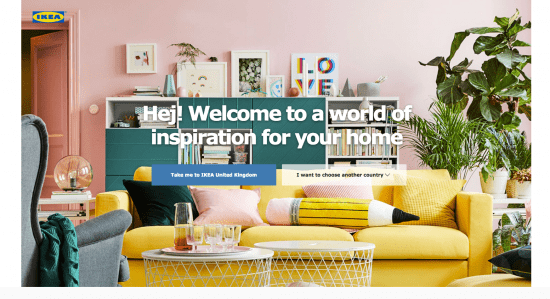 But in the day to day, researchers tend to stick with the same old quantitative and qualitative methods and IKEA clearly does see the value in the survey, but they (along with their insight agency) conducted a customer satisfaction survey with a twist. They turned the survey into a chatbot. 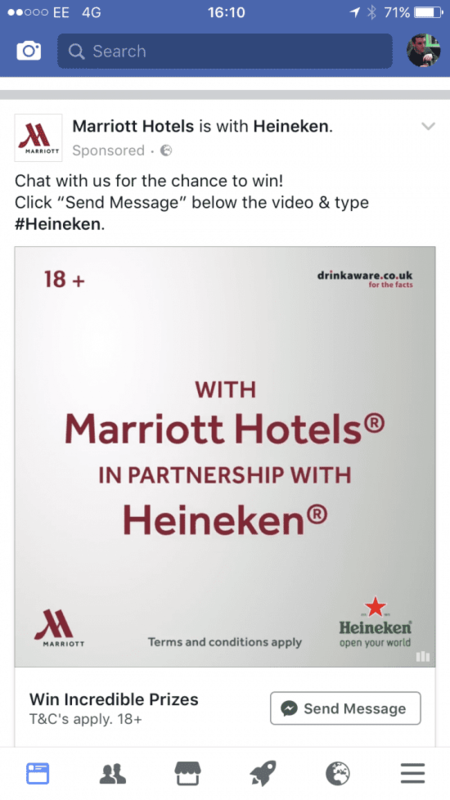 Marketers are starting to embrace the chatbot, Pizza Express have used Facebook Messenger chatbots, as well as Marriott and Heineken. But chatbots aren't used so much for customer feedback. 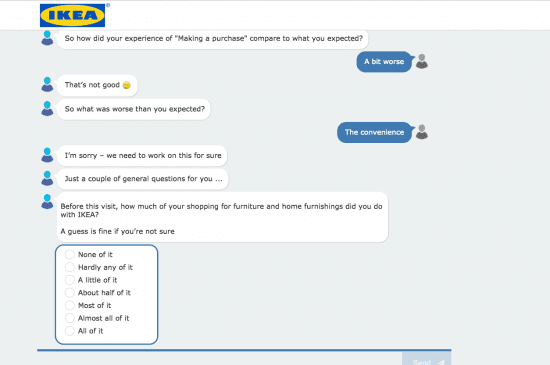 Let's have a look at what IKEA did, why it was a great way to get customer insights and finally how you can do something similar. 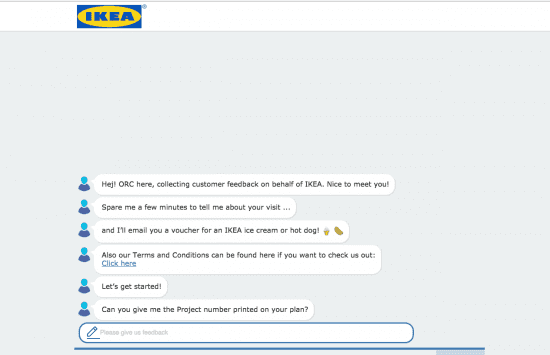 Rather than the usual survey structure, IKEA created a chatbot, called ORC. In typical IKEA branding, they say "Hej!" in Swedish, they offer an incentive and a link to terms and conditions of taking part. It's friendly, appealing, doesn't look like a survey and is fully branded. The survey uses emojis, it asked qualitative questions and quantitative questions. They finish the session with some demographic questions. Why is this survey so great? I love this survey for a number of reasons. Firstly, it's less about length and number of questions. It's more about gaining insight and having a conversation with customers. How many questions were there in the survey? I couldn't tell you. It was also a little longer than expected, but there is no progress bar or question numbers, so participants won't realize - again because it's a conversation. It's easier to reply and seems simpler to reply because it's not a traditional survey. It also offers a real variety of question types and styles, whilst being conversational. It's also rooting around like a survey normally would, but it feels more conversational. It allows you to collect a lot of information in one session too and this is encouraged by the language used ("you've been awesome today"). The questionnaire can be written like a normal questionnaire, but you need the addition of a full script to be produced for every answer. It's also probably much longer to program and for many researchers, there's the issue of getting their heads around another platform. But does it pay off? It's highly engaging and there is only one way to find out: try it. Let's think of this from the user's point of view though: the survey below (not by IKEA) is not very user-friendly, engaging or inviting. It's time for insight to innovate! If you want responses, you have to work for them. What are other companies doing to innovate in the customer insight sphere? The insight world is focusing on automation. 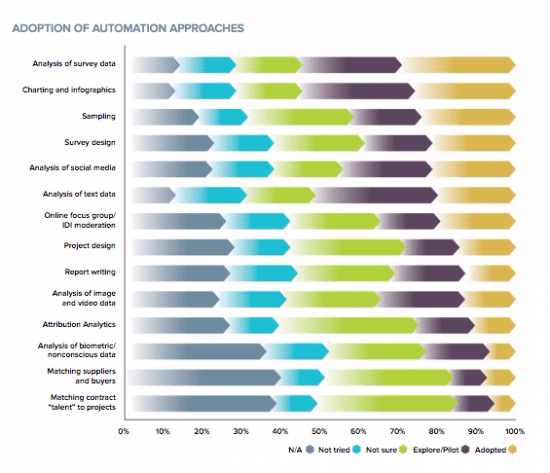 According to the latest GreenBook Research Industry Trends (GRIT) report, there are a number of techniques which researchers are starting to automate, as part of innovating their research. Analysis of test data, project design, matching suppliers and buyers amongst other areas are being automated. 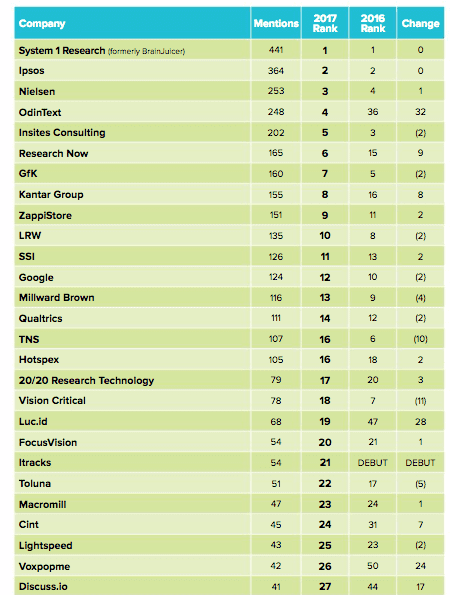 The GRIT report also summarises a number of research agencies and research buyers (clients) who are innovating too. System1, previously known as BrainJuicer has come top or ranked highly for a number of years, their approach to insight is regarded as innovating. They innovate on ad testing and brand tracking. 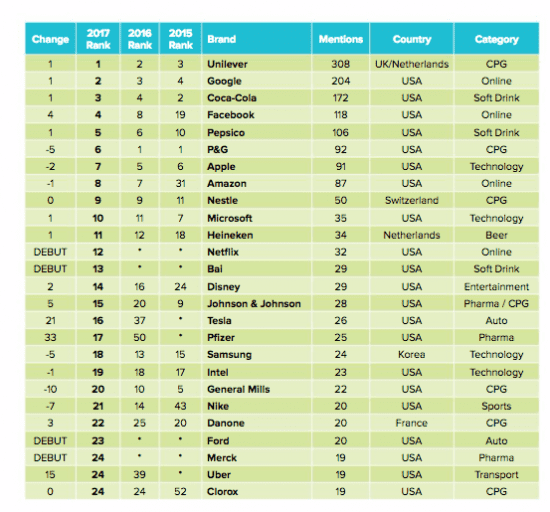 Unilever, Google, Coca-Cola and Facebook are ranked highly as innovative by respondents of the GRIT report. So just how are researchers innovating? 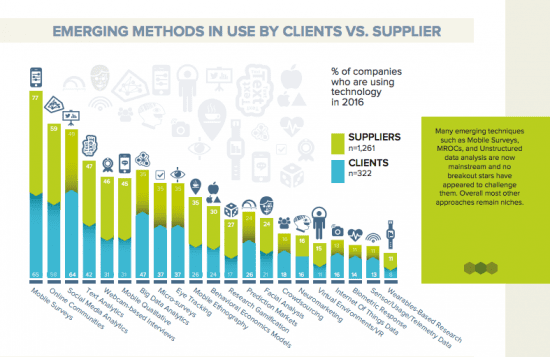 According to a previous GRIT report (2016 Q3-4), mobile surveys, online communities and social media analytics are the emerging methods used by both buyers and suppliers. There's been an explosion in the number of research agencies and software as a service (SAAS) companies offering online communities: even panel companies like Toluna have developed an online community offering. Online communities are a little complex to set-up but offer fast turnaround and are cost effective to run, reducing the cost of insight collection compared to "traditional methods". Social media is also hugely important - marketers are taking advantage of platforms which crawl social networks for comments about brands, to understand customer sentiment towards a brand. I expect this area to grow and become more established over time, for example just crawling social media doesn't always produce useful insight, projects can be more targeted and researchers may end up using technology less and simply delving into social media more manually. Or perhaps they will use social media to ask questions with their audience more - a more conversational approach, like chatbots perhaps? Customers may not always like surveys, but they love conversations.